Recent stick actions by Common Law Lawyers, teachers and the general civil disobedience to government sponsored brutality and killings on the land of John Ngu Foncha, E. M. Endeley, P.M. Kale and Albert Mukong have sparked national and international televised debates over issues framed as identity crisis and marginalization. There is an unfortunate but undeniable fact that colonialism in Africa created new identities. In Cameroon, “La Republique du Cameroun”, gained independence in January 1960 with French oriented civilizational affinities. Southern Cameroon, popularly known as Anglophone Cameroon, are people of various cultural backgrounds who originate from the English speaking regions of the North West and South West Regions of Cameroon, and constitute a minority of 17% of the total population. To talk of a minority in Cameroon brings to mind the fact that there is a relationship between the dominant and the dominated, between the majority and the minority (Ayenka, 2016). Recent televised debates and broadcasts in Cameroon’s national and local media in most cases are framed to undermine and subdue the identity differences with particular interest in making the Anglophone problem and identity in Cameroon look like a farce by the “unintelligent intellectuals” or the “functionally illiterate” (Ayittey, 1997). To test the discourse of the falsification of an Anglophone or southern Cameroon problem, we reopen our political history books and archives to restate the essentials of the today’s conflict. On May 6, 1972, Ahidjo announced to the National Assembly that he intended to transform the Federal Republic into a unitary state, provided that the electorate supported it in a referendum to be held on May 20 (Wolf, 2001). In doing so he rescinded items of the Foumban accord of 1961 which stated that any revision of the constitution would be inadmissible. The breach of the clause with the unholy idea of a united republic and the severe repression of Anglophone leaders prevented them from openly expressing their criticism of the French rule of the Ahidjo regime until 1982. In 1983, the government propagated an order amending the General Certificate of Education Advance Level review (typically English education) to bring it closer to the Baccalaureate (being French). The resulting demonstrations and civil resistance to this attempt to “Frenchify” the English system of education was repressed by police brutality at the University of Yaoundé and in urban centres. In 1984, the government, by its own initiative, changed the name of the country: in spite of strong protests, it would then pass from the “United Republic of Cameroon” to the “Republic of Cameroon” (la Republique du Cameroun), the name of French Cameroon before reunification and Southern Cameroon lost its identity within the unity. This ties directly with Skwirk’s definition of the formation of a colony by a group of people who seek to take control of a territory or country with the installation of an administration over the people and the expansion of their civilisation and culture into this area. In 1985, Fon Gorji Dinka, an English lawyer, was arrested because he distributed a petition declaring the Biya government was unconstitutional and called on Southern Cameroon to become independent. Almost simultaneously, two memoranda were submitted to the UNC ruling in Bamenda by members of the North-West and South West elite residing in Douala, in order to draw attention to the feeling of its side-lining of the Anglophone minority. These different attempts to be recognised led to an experience of contempt. 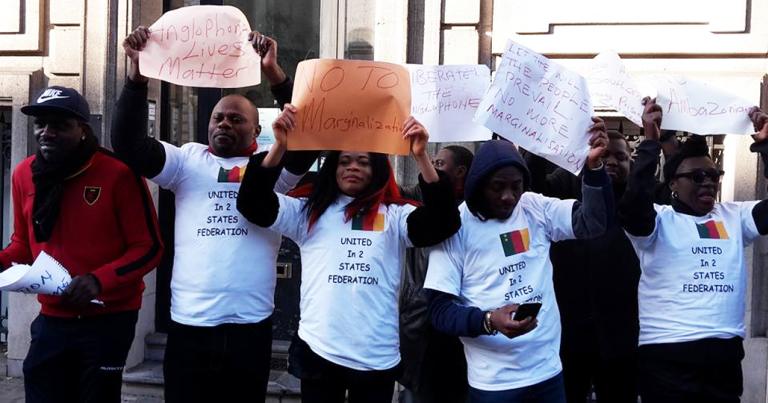 This negatively affected the relationship of Anglophone Cameroonians to the Republic of Cameroon because it diminished their self-confidence and worth as members of the national united community with equal rights, which are the conditions for a positive formation of their identity. A simplistic analysis allows us to draw a parallel between the need for the acknowledgment of an Anglophone problem and the denial of such a problem, as painted in the discourse developing for the violence in Southern Cameroon with the propensity of engendering more conflict. The mere fact that some intellectual groups deny the very existence of a problem, or at least of an Anglophone question, is regarded as a lack of respect by the Anglophone Cameroonians, an attempt at degradation, and the very negation of their existence within the polity of La Republique du Cameroun. Further, the low level of representation of Southern Cameroon citizens in decision-making spheres, the relegation of the English language as a second official language, the fact that Southern Cameroons has become popular imagery, synonymous with unreasonable and marginal, reinforces the Anglophone feeling that it has no social, economic or political value, or at least not the same value as any other constituent group of the Cameroonian society. The results have been the occupation of Southern Cameroon by armed military forces, that violent crimes against humanity have been committed with impunity and the protest march of Common Law lawyers, the strike of teachers of the Northwest and Southwest and the brutalisation of the university students of Buea students. This has been met with political demands to checkmate the absurd claim that the Southern Cameroon question is a farce. To cap it all, if the discourse undermining the Southern Cameroon question and their right to nonviolent civil resistance continues on live television and radio, it will have a likely possibility of inflaming sensitivities and make the situation more complex to negotiate. It is the hope of the genuine intellectual that Cameroon should not join the ranks of modern political happenings as Rwanda, Kosovo and Aleppo that will tinge the collective conscience of this fatherland years later. Ayenka, F. (2016, November). Peace Education and the Fight against Youth Recruitment and Radicalization in the Boko Haram Terrorist Movement in in North Cameroon. (C. Tagou, Ed.) African Journal of Peace Communication and Development, 002, 71-98. Ayittey, G. (1997). Africa in Chaos. New York, United States of America: St. Martin’s Press. Wolf, H.-G. (2001). English in Cameroon. New York: Mouton de Gruyter, Berlin. The unintelligent intellectual in Ayittey’s Africa in Chaos reacts to phenomena. He/ she do not question or sought to understand why what is happening is happening. They ape or mimic what the politicians have put at their disposal. Ayittey calls it the “Monkey dey see, monkey dey do” syndrome. Wolf asserts that Ahidjo disentangled the question of bilingualism from federalism and revealed the perspective of a unitary state in which English as a consequence would lose its exclusive status as the Anglophone part of Cameroon. The failure to implement the Foumban Accord is very useful in the reinterpretation of the political developments in Cameroon from November 2016 and the Anglophone problem in particular.